Tags: craft by proper, Proper Brewing co. 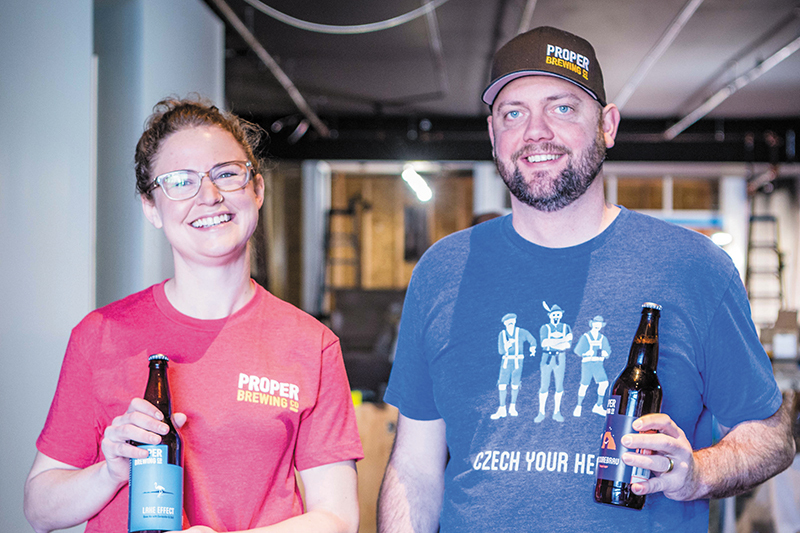 In a few short weeks on April 19, Proper Brewing Co. will open an all-Utah craft beer bar, Craft by Proper. This location is nestled in Sugar House and aims to add a beer bar to the existing nighttime atmosphere, share the love and knowledge of beer and reduce travel concerns by placing many beer, beverage and dining options in one spot. Both Lewis and Tendick explain the complexity of beers and how they age, such as with Squatters’ 529. “The wild yeast in something like the 529 has a different metabolism than regular brewers yeast, and because of this, it makes a series of changes over the years as it ages,” Lewis says. “The variation is recognizable when you compare an aged example to a new batch.” They mention how beer is more diverse than wine when it comes to food pairings and how they want to promote a beer culture that’s esteemed as well—for instance, IPAs go with carrot cake, they tell me. The bar hasn’t even opened, and they’re already teaching via the longstanding “beer nerd” culture that Proper fosters. Lewis shares an interesting theory and perspective on why Utah is experiencing such craft beer growth in the industry and locally: “We have very strict, difficult alcohol laws, and having that much pressure forces everyone to rise above that, and it forces you to create something of even better quality,” she says. 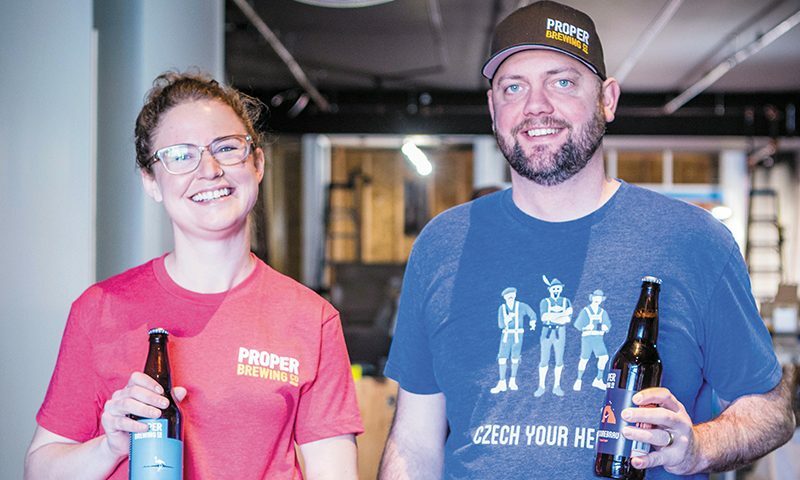 “It’s a weird sort of silver lining.” This speaks to the growth of Proper and their creation of Craft by Proper, as it’s a new pillar that holds Proper and their sister businesses up in quality and value in the craft beer community in SLC. At the time of my visit, the tiles for Craft by Proper were being laid, and it was already blooming with potential. Tendick gestures around the room and explains some elements of the environment-to-be. He points to a small bar upfront, two tops off the wall and the main bar in the middle, then gestures to the back and mentions that Craft by Proper will even have a downstairs area with a projection screen and games. Tendick explains how the bar’s ordering boards will be connected to an app that patrons can download to let them know what’s on tap, how much is left and updates about new releases and special tappings. You can flag favorites and learn about a really tasty seasonal on deck. “Maybe a red pizza phone,” says Lewis, joking. The downstairs portion of Craft by Proper will feel quite separate from the upstairs, and will offer a more intimate setting with a variety of different activities that don’t overlap with what’s upstairs. Karaoke, pool tables, Skee-Ball, pinball, the projection screen, trivia night, video game night, open mics and private events are all in the scope of the downstairs bar area. Tendick points out that the area behind the building will become an outdoor patio area with options for more local live music. The front of the establishment is under a raised garage door facing 2100 South, where Tendick imagines a band playing as people pass by. It is easy to imagine the Sugar House strip filled with live music, food smells and happy faces. “We’d like to have a band playing out here, kinda like Nashville,” says Tendick. Craft by Proper won’t serve meal-oriented food, but Tendick suggests that a beer-and-dessert night and possible pastry offerings/pairings might become a reality in the future. You can check for all future events at the bar’s upcoming site craftbyproper.com. Craft by Proper opens April 19 in Sugar House. Go to learn, hang out and enjoy Utah’s only all-Utah-based craft beer bar.